Getting There: How about some love for roundabouts? Spokane County’s first multilane roundabout opened last week on U.S. Highway 2 just west of Airway Heights, part of the Spokane Tribe of Indians casino development. Despite a wealth of information extolling the benefits of the circular intersection, the word “roundabout” causes shivers and engages local drivers’ lizard brains. It’s as if the four-way stop were covered in the Bill of Rights. But it’s not, so bring on the roundabout. They’re safer, more efficient, cheaper and, let’s be honest, simply more elegant than conventional intersections. So why the hate? According to the American Association of State Highway and Transportation Officials, roundabouts reduce the number of crashes where people are seriously hurt or killed by about 80 percent when compared to conventional signalized intersections. Studies done by the Insurance Institute for Highway Safety and the Federal Highway Administration show that roundabouts reduced fatal collisions by 90 percent. Research at the University of Wisconsin-Madison found a 38 percent drop in car deaths and injuries at Wisconsin intersections converted to roundabouts. The benefits are so clear that the Federal Highway Administration’s Office of Safety urges planners to build roundabouts as a proven way to increase safety for all users: motorists, pedestrians and bicyclists. The safety comes from the reduced speed of vehicles entering the circular intersections. The typical speeds in a roundabout are about 15 to 20 mph, part of the design’s intent. The intersections also dramatically lower the number of potential crashes between vehicles. Planners have identified 32 “conflict points” in a conventional intersection. In a roundabout, there are just eight, primarily because traffic never crosses. Because it’s a circle. But when commuters are in a rush, careful driving can go out the window and safety takes a back seat to getting somewhere on time. Even in this realm, roundabouts have proven to help. 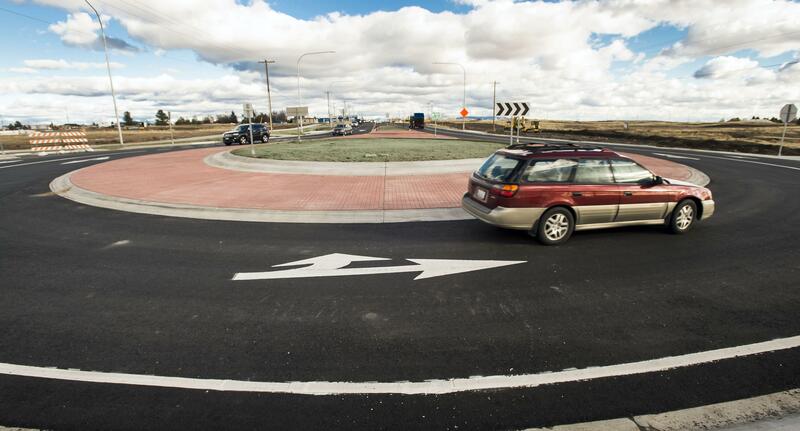 Studies by Kansas State University showed a 20 percent reduction in delays at intersection converted to roundabouts. Additional studies by the Insurance Institute for Highway Safety of intersections in three states, including Washington, found that roundabouts contributed to a nearly 90 percent reduction in delays, and a 56 percent reduction in vehicle stops. Kansas State did another study showing that by replacing four-way stops with roundabouts, carbon monoxide emissions were reduced by around 40 percent and carbon dioxide emissions by about 60 percent. Nitrogen oxides dropped by around 50 percent, and hydrocarbons fell by more than 60 percent. The reasons for the reduction are many, but the bulk of emissions don’t necessarily come from idling while waiting for the green. Emissions jump when vehicles accelerate from a stop sign or red light. For intransigent readers who fail to see the benefits of the roundabout, the Washington State Department of Transportation says circular intersections save money over time, compared to traditional signalized stops. While the cost to build roundabouts and conventional intersections is similar, roundabouts don’t have the same hardware, maintenance and electrical costs of a conventional intersection, which can cost between $5,000 and $10,000 a year. Still not convinced? You’re not alone. The United States is definitely not in love with the roundabout. Damien Saunder, who is now a cartographer at Apple, analyzed mapping data and found that drivers in France, Germany, Great Britain, Spain and Australia encounter roundabouts far more frequently than American motorists. On average, American drivers pass through 1,118 intersections before driving through a roundabout. In France, motorists pass through just 45 intersections before reaching a roundabout. While crashes involving injuries or fatalities have plummeted, the lack of roundabouts may be responsible for an uptick in the total number of crashes at them. According to researchers at the University of Wisconsin-Madison, the number of crashes at intersections converted to roundabouts went up 12 percent. The crashes caused property damage, primarily, and the researchers attributed them to confused or unprepared drivers trying to navigate the unfamiliar roadway design. Saunder’s mapping analysis, which was based on 2014 data, found 10,341 roundabouts nationwide, with Florida having the most. The Washington transportation department says there are already 120 in the state highway system, with more to come. Following the one built near Airway Heights by the Spokane Tribe of Indians, another multilane roundabout is planned by the new Costco site north of town on U.S. Highway 2, and a number of single-lane roundabouts are coming to Deer Park in 2018. But will we, the American driver, ever accept the simple roundabout? At least one British journalist doesn’t think so. Have a transportation question you want answered? Write nickd@spokesman.com. As usual, Thanksgiving drivers should prepare for and expect delays. Many of us will cross the state to share thanks, but even those making a local trip should expect crosstown traffic. In the mountains, state Route 123 Cayuse Pass, state Route 20 North Cascades Highway and Chinook Pass are closed for the winter. For Snoqualmie Pass, you can receive text alerts for pass delays 30 minutes or longer. Just text “wsdot snoqualmie” to 468311. For those traveling to the Apple Cup on Saturday in Seattle, plan ahead for possible winter weather on passes and allow extra travel time both to and from the game. Even those who are avoiding the personal automobile should plan ahead. Spokane Transit has holiday service on Thanksgiving, which is the same as its Sunday service. For specific information on routes and schedules, visit www.spokanetransit.com/routes-schedules/routes. On the West Side, plan ahead for heavy holiday ferry traffic. The longest lines are expected westbound Wednesday afternoon and evening, and eastbound Friday morning. Some ferry routes will run on Saturday schedules for the holiday, so visit www.wsdot.wa.gov/ferries/ or call (888) 808-7977 for details. The Republican plan to reshape the nation’s tax code could hit owners of electric vehicles and bicycle commuters. Last week, the House voted to repeal a $7,500 tax credit for buyers of electric cars as part of its tax overhaul. The repeal of this one credit equates to about $200 million, according to the Joint Committee on Taxation. The move came as other nations are considering ways to sell more of those vehicles, including China. In September, China issued strict regulations requiring automakers to sell a large number of electric vehicles if they want to continue selling gas-powered ones. Volkswagen announced last week it would introduce 25 electric car models within a decade in China, a $12 billion investment. General Motors and Nissan are both considering big roll-outs of electric vehicles in the country. “With over 850,000 cyclists regularly commuting to work, there is absolutely no reason to wipe out incentives for one of the cleanest, healthiest and environmentally friendly modes of transportation that exists today. This is outrageous,” Blumenauer said, according to BikePortland.org.